Seasonal sushi, noodles and tempura are specialties at this Tokyo institution. 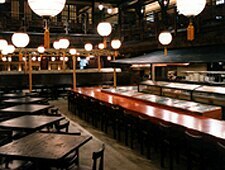 : President George W. Bush dined here with Japan's former Prime Minister Koizumi, Quentin Tarantino shot scenes here for "Kill Bill," and those are only a couple of the reasons that this energetic, three-story place is an institution. It's really several restaurants in one---typically sushi, noodles and tempura can be found only in specialty restaurants---spread over three floors and many rooms, all decorated Japanese country style. Come for handmade soba noodles and tempura dishes including kuruma ebi (tiger prawn) and renkon (lotus root). Seasonal sushi includes---unusual in Japan---westernized offerings like California rolls. Service is spirited.